If you are attempting to decide between Yoga or Pilates, this and my previous blog will give you a rundown of each and how to decide which might best suit your needs. Part one included a full description of the various styles of Yoga and how to choose the best one for you. The Pilates Method was founded on and continues to be based on the visions of its founder Joseph Pilates. He was a an athlete interested in Eastern AND Western medicine who developed a practice that would give you the tone and strength of a boxer or dancer. Similar to Yoga, it follows the principles of balancing the body. Also like Yoga it is a practice of poses and postures however it incorporates a repetition / fine tuning of a secondary movement while sustaining that posture. The exercises are focused more on precise and concentrated control in small to large ranges of movement for improving flexibility and developing the core or “Powerhouse”. The last two principles similar to Yoga are coordination of breath and Flow of movement during engagement of the postures. One of the main reasons that Physical Therapists are such advocates of The Pilates Method is that it focuses on the main stabilizing structures of the trunk that tend to contributing or directly linked with the spinal and peripheral injuries we see every day. The Serratus Anterior, Longus Coli, Transverse Abdominis, Multifidis, pelvic floor, diaphragm, deep hip rotators, and rotator cuff are the key contributors for local stabilization the spine, hips, and shoulders. Many of these muscle groups segmentally attach to the spine / ribcage which enhance the positioning and precise movements necessary for rehabilitating or preventing an injured spine. The big “mover” muscles on the surface of the body (pecs, lats, traps, gluteals, and rectus abdominis) are responsible for large, powerful movements required for daily movements and enhancing athletic performance. However if they get weak / shortened due to postural changes or over training they become problematic. While Pilates strengthens the deep stabilizers as mentioned above, it also works at elongating these superficial “movers” that might be problematic. 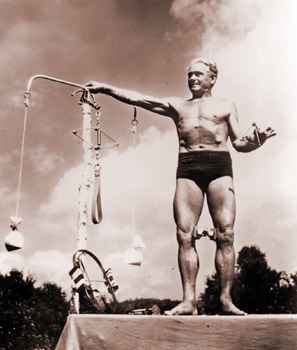 The Pilates Method founder was a boxer, diver, skier, gymnast, and war hero (as a Nurse) from Germany. He served in WWI and invented his first apparatus (a version similar to today’s Reformer and Cadillac) in which he attached springs to hospital beds so that wounded soldiers could continue to strengthen their bodies while healing from their injuries. In a lot of ways, Joseph Pilates was a Physical Therapist, although Physical Therapy was not invented in the US until the Polio Epidemic. These were the first indications that Nurses could not care for the sick/wounded patients in addition provide rehabilitation. They needed another practitioner to emphasize the relearning of fine and gross motor skills necessary for them to return to prior level of function. We will save that for another Blog. Well, the Pilates idea was a hit. He was asked to train military personnel, famous athletes, and eventually emigrated to NYC to open his first studio in 1926. He went on to develop 500+ exercises on the principles still used today: concentration, control, centering, flow, precision, and breathing. He turned Pilates into an art and developed many instructors to continue advancing and spreading the benefits of it. This video demonstrates how beautiful the movements are when performed by advanced students. The movements came to assist in the physical training of advanced technical dancing and continues to be one of the training methods of choice for them. 1) Mat Classes – as in Yoga Classes, mat classes follow a logical sequence of postures/exercises. Similar to Yoga, classes are in group setting and do not allow for individual instruction. Classes are usually offered in gyms (as part of the membership) or Pilates studios for 15-20$. 2) Apparatus or Machine work – Using the Reformer, Cadillac, Wunda Chair, Ladder Barrel and Magic Circle (to name a few) these sessions are usually one on one or very small groups. This allows for more individual manual and verbal cues from the instructor on proper breathing and form. One of the downfalls of the individual lesson is that it costs a lot more. It is comparable to having a personal trainer (50-120$/ hour). Of course, some the the best success stories come from those who hire individualized training. In my opinion, there are good, bad, and mediocre instructors. Most people only need mediocre instructors to actually see a change. Once you learn the form, the instructor becomes a coach more than anything. If your goals are to become advanced at Pilates, then get a good instructor, pay the bucks, and watch your body dramatically change. If you are motivated and have the opportunity to take a few individual classes to get going and maintain your practice with a Mat class, you will see good results. It just depends on your ultimate goal. If you have an injury and want to continue your Pilates practice after a rehabilitation course, I would recommend individualized Pilates. This will allow you to communicate better with your instructor on proper modifications and any symptoms you may be having. Like Yoga Studios, Pilates studios can be found in every City in the world and in many private locations (homes) as well. A good list of resources are listed below to help you find a reputable location. Depending on your ultimate goals, the factors described above will help you make a decision on which is best for you. I tell my clients who have never experienced either to begin with Yoga. Especially if you have limited flexibility. Many of the Pilates poses (even the beginners ones) require at least a moderate amount of hip flexibility and if attempted might leave you feeling frustrated. For those who have natural flexibility or hypermobility in the joints, Pilates would better meet your deficits safely as it would focus on supporting your spine. Now, does that mean that Yoga doesn’t improve core stability and Pilates doesn’t improve flexibility? No. Quite the opposite. Both practices will improve these deficits, they just focus on them in a slightly different manner. Many people will choose Yoga for the spiritual component alone. Myself included. To solve this problem of choosing, gyms have come up with classes that work on Yoga and Pilates principles (eg. PiYo at 24 hour fitness). In the end, it might be better to do a little of both. Find your preference by trying a few classes of each and finding your FLOW. Hi, Jess I just found your blog and appreciate the good advice, and find it similar to what I give. The post on posture is great. I put more emphasis on stretching, but couldn’t agree more about your point on not training the dysfunction. Regarding Pilates, I think it is very good, but it is limited by how much of the work is done while lying down. This isn’t surprising considering its origin, but I think exercising while standing is critical to training the body for both everyday life and most sports. Yoga is also great, and much better for variety, but doesn’t have the strength training component. My opinion is that non-athletic yoga classes plus functional strength training is probably ideal for most people. I couldn’t agree more about the fact that Yoga or Pilates alone doesn’t cut it. Personally, I prefer high intensity functional strength training the best. It just seems to be a question that many of my patients ask met so I thought I would summarize both so that people could decide for themselves. Many people need to attend classes that won’t empty their pocket but have more bang for the buck (best workout, safe, and affordable). In the facility I work we have developed a functional training fitness class in attempt to get these people “off their backs.” It still is not nearly as popular as our Pilates classes, but we hope it grows. Brain Benefits of Exercise. Getting Back on My Soapbox. Golf off-season. What are you doing? Fit for the Slopes – Quick!